Today on the Nose, we love the Olympics; but we also know them to be soiled, by doping and by the corruption that inevitably accompanies picking a location. But, as Juliet Macur aptly explains, even the latest round of doping scandals — which point at cheating that is even more widespread than we might have previously expected — will not dissuade us. Olympics = Brokeback. We can’t quit them. Outside the Lines obtained a confidential U.S. Olympic Committee planning document written in October 2015 that states, “The USOC has ongoing concerns over possible existing viral and bacterial contaminants in the water. … The USOC remains hopeful, but we do not expect to anticipate major reductions [italics are the USOC’s] in bacterial or viral pathogen levels at the competition venues. “There is currently no way to ‘zero out’ the risk of infection or illness when competition occurs in any water, and especially in Rio waters,” the document states. “Raw sewage. The athletes do not talk about it. … They are not there to challenge the world’s environmental issues. But the athletes are all concerned and deeply worried…The contrast between Rio’s topographic beauty and the horrors in its waters shocked van Rijsselberghe in his first race there in 2013. “We had to slalom through the water to avoid plastic garden chairs, a refrigerator, [dead] animals,” he says in a phone interview. He saw fewer large floating objects this time and knows of no Dutch athlete who got sick, but he is still disturbed by the conditions. “It’s not as simple as putting a few filters here or there,” he says. 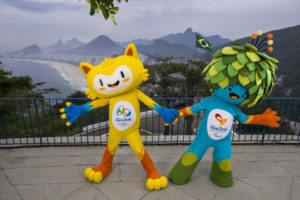 There are multiple equity issues at stake, ranging from the article’s speculation that wealthy Olympic tourists will bring Zika home to poorer populations in countries lacking sufficient treatment resources to the reality that women athletes and journalists will bear disproportionate risk at these games. Lastly, Brazil is in the middle of something that looks like a coup. How often to the Olympics take place in the middle of unscheduled regime change? Meanwhile, Brazil has at least $25 billion in sunk costs — a splurge whose benefits are unlikely to make it back to the favelas.